Hello, newbie here; first post. I’m a newbie both to this forum and also gardening more generally. I want to make the most effective and efficient raised bed for growing that I can. About beds in general: when looking at a bed or design, what kind of measures/variables can I look for to assess it’s effectiveness? Say: any measures of growth in vegetables, factors that influence success/growth of vegetables? About the height of beds: what height, or height range, is the most efficient and effective? I read previously about a minimum of 6” from one source, and 8-12” or more on another. This kind of ties in with my first question. Are there reasons for these different height recommendations, like factors that influence growth? Climate question: does my local environment condition factor into design when building a bed? I’m living in Kent, South East England, UK. Hope I posted in the right forum section here, and that these questions make sense! Kent's pretty dry, yes?, so you'll spend a lot of time watering in the summer. To that end make sure you have plenty of organic matter in whatever you fill the beds with. As to height, I asked the question a little while ago on here and 9" seemed to be the answer. That fits well with using two 6"x1" planks for the sides. That was for growing (mostly) herbs. For vegetables you might need to be a lot deeper, for example for carrots. I'll be using treated wood, so I worried about what might leach into the soil and thus the plants and thus me! Line with plastic was the answer to that one. Of course I'd like to build it from oak sleepers, but they're pretty pricey! I wouldn't worry too much about it. As DGM said, your conditions are likely to be dry so the deeper your beds are the better as you can put a greater depth of organic matter in the bottom which will aid water retention. Raised beds are better being not more than 3ft wide so you can reach from each side for weeding. You need enough space between each to walk and kneel down in. Length is your choice and situation but not so long as to make it nuisance to walk round. Height is also a matter of personal choice and what you want to grow but personally I think about 12" is about right. We used decking boards as they're usually treated against rot. Or scaffold boards are another choice. Enjoy your growing. I would say that it depends on what is under it (good soil, bad soil, no soil?) and what you want to grow in it. But raised beds are quite a modern concept, vegetables are traditionally (at least in my home country) grown directly in the ground (at least where soil quality allows it). Raised beds give you more convenience and comfort and also more control over the soil and growing conditions but it's not the only way how to grow things. 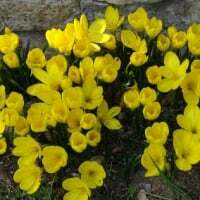 They are certainly useful in areas with bad soil or not enough soil. I agree with edkelka, how high you go depends on if you have a decent depth of good soil underneath- if you have that you can get away with 6”. If your soil is poor, go higher and mix in/fill with good quality organic matter including manure. Vegetables are hungry and water and sunlight thirsty as they have to deliver mature fruits/roots within a short growing season, so they need the best conditions you can give them. I find you can get away with more closely spaced rows than if growing in ordinary, open ground as you don’t need to be able to walk between rows to harvest (providing you don’t make them too wide - and you don’t want to be walking on the soil either so thats another reason for being able to reach across easily). Like others have said. The deeper the better and make sure the soil is good quality. Get a good mix of soil and you should do well. I started growing veg and also cut flowers in raised beds last year with great results. I had to keep things well watered and thanks to having great soil the veg and flowers thrived. Good luck and happy gardening! One other point no one else has mentioned when you fill your beds you do need to firm the soil/compost down. I know many people worry about compaction but if you just pour in loose material and don't firm it then it will dry out too fast. The easiest way to do this is to get a board and walk up & down on it a couple of times. The moisture can then "wick" up from the soil below but as others have said unless you get frequent rain you will still have to water regularly, but with all veg best give a good soak once a week rather than a little bit every 2 days. Hubby used gravel and scaffold boards to make our raised beds, I add home made compost, manure, spent compost from old pots. Just building our own new raised beds about 8" high. Going to fill them with home made compost and well rotted leaves, straw and wood chips. Just trying different things in different beds as an experiment. For me, having raised beds is more about having defined areas for veggies and fruits with paths between so I'm not ever walking on cultivated soil or precious plants. Height is purely subjective. If your general soil is good then one plank width is fine for defining a bed and holding in the extra mulches of topsoil/compost/leaf mould/manure you will add over time to keep the soil in good heart. If you make the corner posts higher you can easily add extra boards later if needed and they'll also stop the hose-pipe from whamming across the beds and flattening plants. makes it easier t drape netting or polythene sheets too when you want to protect plants from pests or cold. If you have physical problems, building them knee height and sturdy enough to put a flat board all round the edge, you can sit while you weed, sow, plant, harvest. Deeper beds also let you grow deep rooted plants such as carrots, parsnips, asparagus if your basic soil is poor or solid clay. As to width, the general consensus is 4'/120cm wide so you can reach into the middle from both sides without compressing the soil.